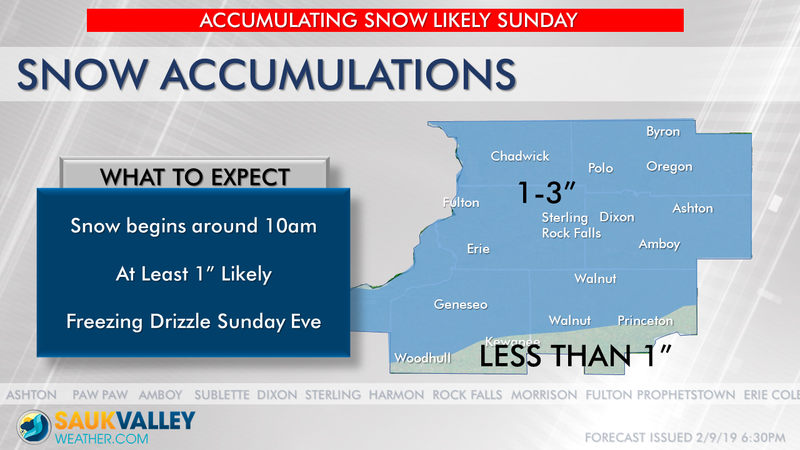 TIMING: Snow begins shortly after 10am lasting until around 6pm Sunday evening. Freezing drizzle will then follow through the evening hours before ending around midnight Monday morning. AMOUNTS: Snowfall accumulations of at least 1″ are likely with scattered areas of 2-3 inches area-wide. A thin glaze of ice is also likely, especially on elevated surfaces Sunday evening. HAZARDS: Roads will likely become snow-covered in spots. Winds will remain light, limiting blowing/drifting snow. Untreated roads will be vulnerable to a light glaze of ice Sunday evening.